The standard gear reducer is also called a gear reducer and a gear box. It is a separate transmission. It is composed of a sealed box body, a pair or several pairs of gears ( or worm gears )、drive shafts and bearings. Standard gear reducer is often installed between the motor and the working machine to reduce the speed and correspondingly increase the torque. In some cases it can also be used to increase speed, in which case it is called a speed increaser. Reducer features and applications: Reducer features: compact structure, large transmission power range, reliable operation, long life, high efficiency, easy to use and maintain. Application: Very extensive. Its main parameters have been standardized and produced in specialized factories. 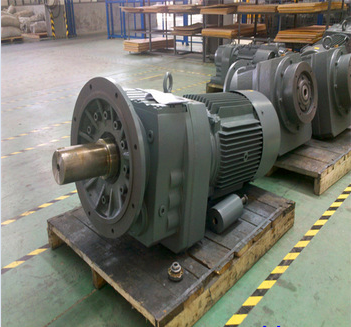 Under normal circumstances, according to the work requirements, according to the transmission ratio, input shaft power and speed, load conditions, etc., you can use a standard gear reducer; if necessary, you can also design and manufacture. 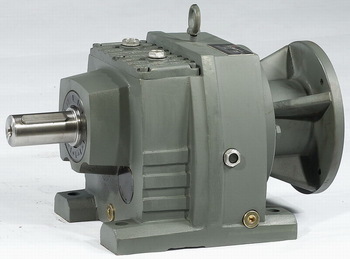 After precision machining to ensure shaft parallelism and positioning bearing requirements, the reducer that forms the helical gear transmission assembly is equipped with various types of motors, which are combined into mechatronics, which fully guarantees the quality characteristics of the geared motor products. R..R type: The combination of the two models can form a large transmission ratio, and can also be combined with the R series reducer, K series reducer, S series reducer and F series reducer of the same series. R reducer is a standard gear reducer principle that uses gear transmission to reduce the speed of motor (motor) and increase output torque. 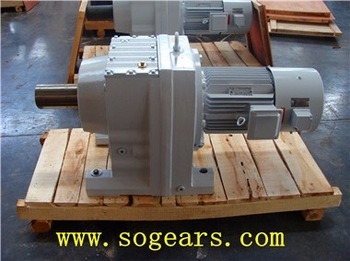 It adopts the gearbox and gear meshing, and the design is advanced and the structure is novel. In most cases, this type of reducer has replaced two-stage and three-stage ordinary cycloid reducer in metallurgy, mining, petroleum, chemical, marine, light industry, food, textile, printing and dyeing, pharmaceutical, rubber, plastic. And hoisting transportation and other aspects have been increasingly widely used. Motor F-class insulation, IP54 protection, 380 volt, 50 Hz three-phase asynchronous motor, suitable for operation under ambient temperature -10 °C -40 °C, altitude 1000m, if beyond the above conditions. Please contact the reducer manufacturer.